While you were trying to figure out if you wanted to try a cronut from Refreshment Port at Epcot (duh…the answer is yes…), here’s what you missed this week in the Disney News and Rumors department. It’s finally here! Saving Mr. Banks officially makes its way to all theaters today and everybody is talking about it! The Hollywood Reporter shares the back story of how this fantastic film was able to be created. Also, looking for more Saving Mr. Banks fun, check out the e-book called Saving Mr. Banks – The Official Multi-Touch Book which contains stories, videos, music, fun facts and more all about the making of both Mary Poppins and Saving Mr. Banks. The book is available via iBooks and is FREE! With the Holidays here, I’m sure you’re like me and catching every Christmas movie ever made. One of the best ones is The Muppet Christmas Carol. Buzzfeed has a look at 14 Things You Didn’t Know about the movie. Disney is recently riding the wave of their current animated hit, Frozen, but they are already working on animated film magic scheduled all the way out to 2018. According to Moviefone, Disney’s Moana is slated to tell the tale of a “a sea-voyaging enthusiast, and the only daughter of a chief in a long line of navigators.” Interesting. Can’t wait to hear more as we get closer to 2018! Walt passed away on December 15, 1966, and in remembrance of that day, CBS News ran a news piece called Almanac: Walt Disney. The article discussed a few highlights of Mr. Disney’s life that was cut short too soon. Also interesting was the included look at some of Disney’s more obscure characters. In addition, I came across this video this week, that I had never seen before and thought was perfect to share, given the anniversary of Walt’s passing. It’s certainly not recent, but it’s a great glimpse into the Walt Disney Family Museum and what it showcases and a little bit about the man himself. This week marks the end of the Walt Disney World’s seven (seven!) weeks of Mickey’s Very Merry Christmas Parties for 2013. What does this mean for you? Holiday Wishes will be shown on all nights between the 21st and New Year’s Eve, so if you missed out on the parties, now is the time to catch the show without the hard ticket charge. New Year’s fireworks will go off December 30 and 31st starting at 11:50PM (hey, if Christmas lasts 2 months, New Year’s Eve can be 2 nights, right?). Don’t forget the Crowd Calendar is your friend when trying to navigate the most crowded time of year at Walt Disney World. Are you in the Orlando area and needing a BabyCakes fix? They announced local delivery this week. It might be easier than grabbing a parking spot at Downtown Disney right now, just saying. Ever been at Walt Disney World during a runDisney race weekend? Did you know that you can sign up to volunteer to help out at the event? Here’s where you can register or find out more. What didn’t we mention here this week that you can’t believe we missed? 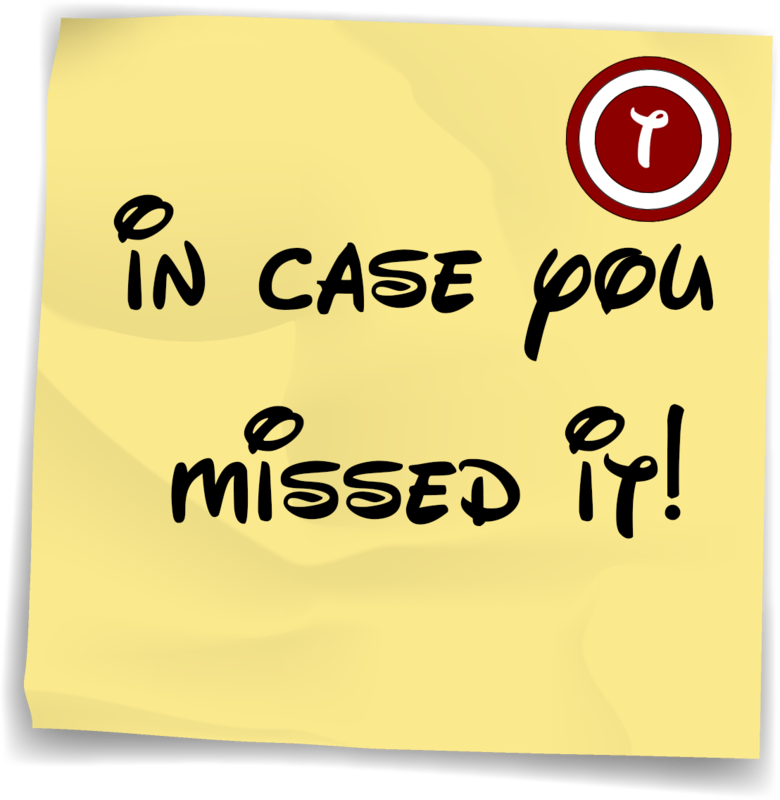 Write your idea on a Disney Infinity Starter Pack and send it to blog@touringplans.com with the words “In Case You Missed It” in the subject line. ← This Week On TouringPlans YouTube Channel: Christmas Fantasy Parade, Newsboys, Hillbillies and More!